Syed-Abdul, Majid M. Hu, Qiong Jacome-Sosa, Miriam Padilla, Jaume Manrique-Acevedo, Camila Heimowitz, Colette and Parks, Elizabeth J. 2018. Effect of carbohydrate restriction-induced weight loss on aortic pulse wave velocity in overweight men and women. Applied Physiology, Nutrition, and Metabolism, Vol. 43, Issue. 12, p. 1247. Wright, N Wilson, L Smith, M Duncan, B and McHugh, P 2017. The BROAD study: A randomised controlled trial using a whole food plant-based diet in the community for obesity, ischaemic heart disease or diabetes. Nutrition & Diabetes, Vol. 7, Issue. 3, p. e256. Zhang, Hong and Zhai, Cheng-kai 2016. Effects of Chinese and North American Wild Rice on Blood Lipids, Oxidative Stress, and Inflammation Factors in Hyperlipidemic Rats. Cereal Chemistry Journal, Vol. 93, Issue. 4, p. 357. Jovanovski, Elena Zurbau, Andreea and Vuksan, Vladimir 2015. Carbohydrates and Endothelial Function: Is a Low-Carbohydrate Diet or a Low-Glycemic Index Diet Favourable for Vascular Health?. Clinical Nutrition Research, Vol. 4, Issue. 2, p. 69. Joris, Peter J. Zeegers, Maurice P. and Mensink, Ronald P. 2015. Weight loss improves fasting flow-mediated vasodilation in adults: A meta-analysis of intervention studies. Atherosclerosis, Vol. 239, Issue. 1, p. 21. Martinez, J. Alfredo Navas-Carretero, Santiago Saris, Wim H. M. and Astrup, Arne 2014. Personalized weight loss strategies—the role of macronutrient distribution. Nature Reviews Endocrinology, Vol. 10, Issue. 12, p. 749. Liebman, Michael 2014. When and why carbohydrate restriction can be a viable option. Nutrition, Vol. 30, Issue. 7-8, p. 748. 1Bueno, NB, de Melo, IS, de Oliveira, SL, et al. (2013) Very-low-carbohydrate ketogenic diet v. low-fat diet for long-term weight loss: a meta-analysis of randomised controlled trials. Br J Nutr (Epublication ahead of print version 7 May 2013). 2Inaba, Y, Chen, JA & Bergmann, SR (2010) Prediction of future cardiovascular outcomes by flow-mediated vasodilatation of brachial artery: a meta-analysis. Int J Cardiovasc Imaging 26, 631–640. 3Hu, T, Mills, KT, Yao, L, et al. (2012) Effects of low-carbohydrate diets versus low-fat diets on metabolic risk factors: a meta-analysis of randomized controlled clinical trials. Am J Epidemiol 176, Suppl. 7, S44–S54. 4Buscemi, S, Verga, S, Tranchina, MR, et al. (2009) Effects of hypocaloric very-low-carbohydrate diet vs. Mediterranean diet on endothelial function in obese women. Eur J Clin Invest 39, 339–347. 5de Roos, NM, Bots, ML, Siebelink, E, et al. (2001) Flow-mediated vasodilation is not impaired when HDL-cholesterol is lowered by substituting carbohydrates for monounsaturated fat. Br J Nutr 86, 181–188. 6Phillips, SA, Jurva, JW, Syed, AQ, et al. (2008) Benefit of low-fat over low-carbohydrate diet on endothelial health in obesity. Hypertension 51, 376–382. 7Varady, KA, Bhutani, S, Klempel, MC, et al. (2011) Improvements in vascular health by a low-fat diet, but not a high-fat diet, are mediated by changes in adipocyte biology. Nutr J 10, 8. 8Volek, JS, Ballard, KD, Silvestre, R, et al. 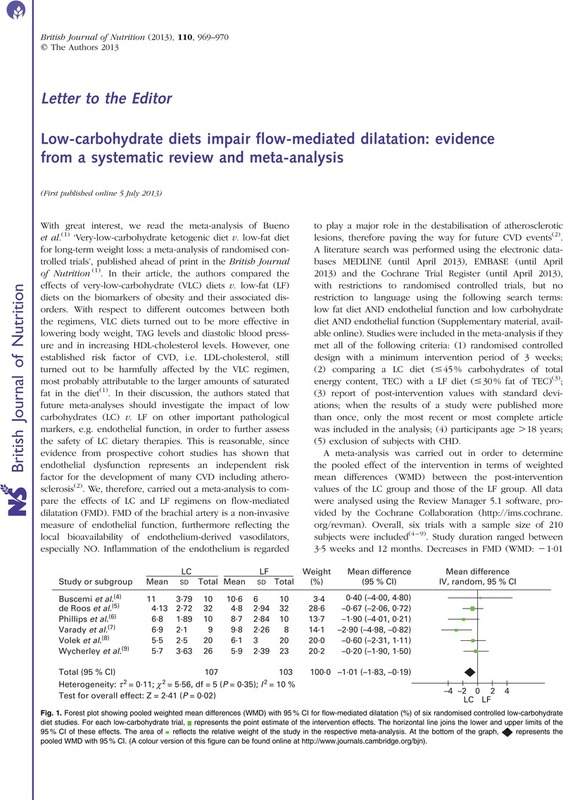 (2009) Effects of dietary carbohydrate restriction versus low-fat diet on flow-mediated dilation. Metabolism 58, 1769–1777. 9Wycherley, TP, Brinkworth, GD, Keogh, JB, et al. (2010) Long-term effects of weight loss with a very low carbohydrate and low fat diet on vascular function in overweight and obese patients. J Intern Med 267, 452–461. 10Noto, H, Goto, A, Tsujimoto, T, et al. (2013) Low-carbohydrate diets and all-cause mortality: a systematic review and meta-analysis of observational studies. PLOS ONE 8, e55030.